These custom witness pins are made from pattern card stock, silver cross and coordinating ribbon with a pin backing details. 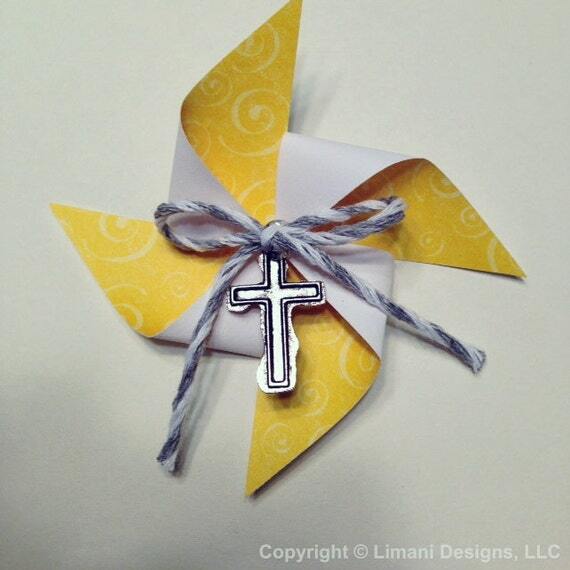 These pinwheel pins will be made to coordinate with the color palette you will be using for your event. The listing is for a dozen pins, please let us know how many pins you will need in increments of 12. We will need at least 3 weeks before your event to complete the orders. Shipping can take up to 7-10 business days to deliver. Shipping charges will be calculated based on your location. Please do not order this listing directly, we will make a custom listing for you to order from. Thank you for visiting our shop and we look forward to working with you!